The al-4SB subwoofer is designed specifically for use with the al-4 Subcompact Line Array System. Benefitting from the same advanced isobaric loading found in our formidable as-418 subwoofer, the al-4SB extracts exceptional low-frequency output from a very compact package. 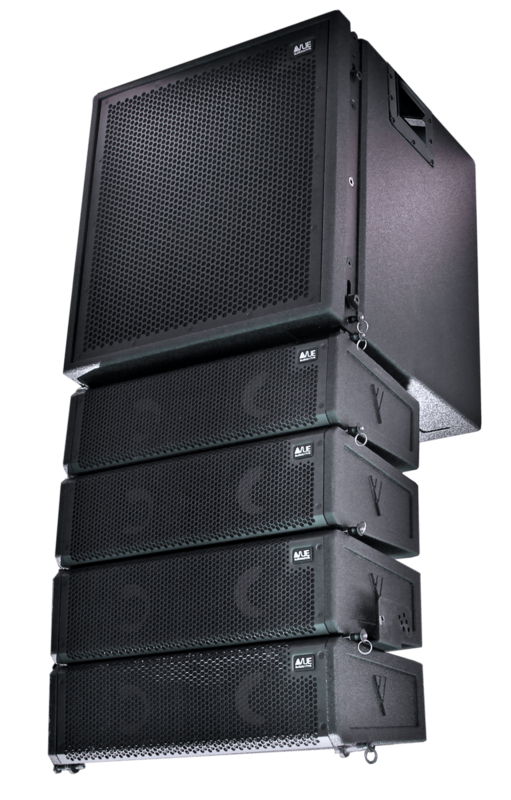 When combined with an al-4 line array system, the al-4SB delivers powerful and well-defined low-frequency reproduction down to 45 Hz. 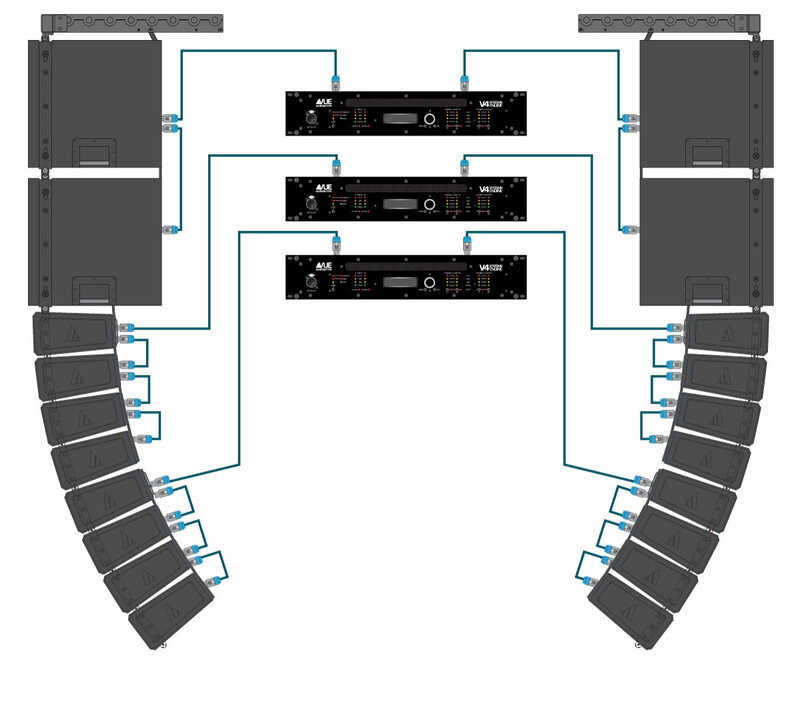 The al-4SB can also be used along with additional ground stacked VUE subwoofers to further extend low-frequency response and increase overall system output. The al-4SB is equipped with hardware for ground stacking small arrays of al-4’s (using the SP-24 speaker pole). At the heart of the al-4SB are two powerful, precision-engineered 15-inch transducers that feature neodymium magnets and large 4-inch (100 mm) diameter voice coils for high power handling and reduced power compression. 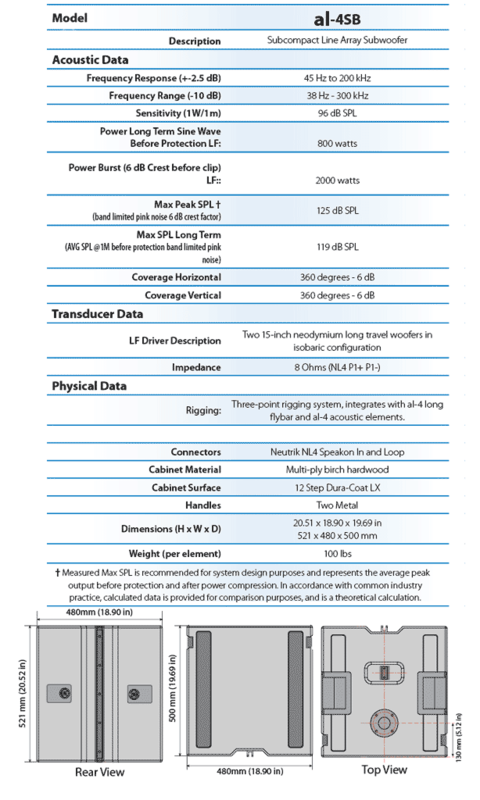 These two powerful transducers are placed in a front-to-front, isobaric (push-pull) configuration. 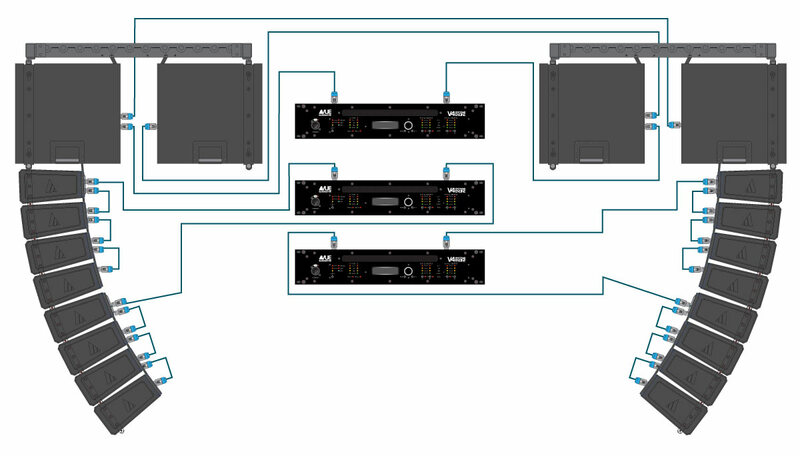 The unique qualities of the isobaric design allow the tightly coupled woofers to work as if they were a single unit in a vented box with double the internal volume. The net result is dramatic increase in output and low-end frequency response—all from an enclosure that’s significantly smaller than a conventional dual 15-inch design. The al-4SB enclosure is constructed of top quality birch plywood, coated in the same durable 12-step Dura-Coat LX finish as the al-4 acoustic elements. Extensive interior bracing ensures resonant-free low-frequency performance. The machined, powder-coated steel grill with acoustically transparent lining provides ample driver protection while completing the top-quality al-Class aesthetic. 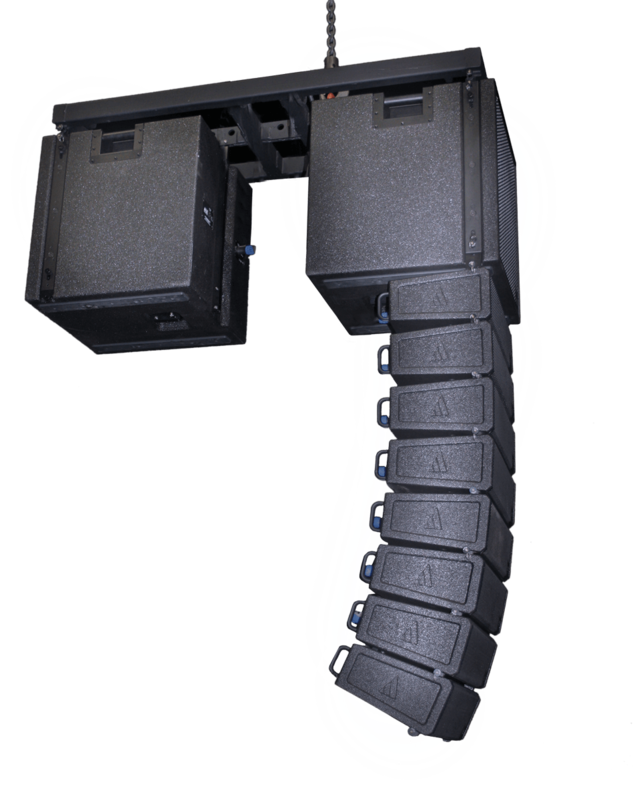 Integrated suspencion hardware ensures that the al-4SB is perfectly configured for use in any al-4 Line Array System in both flown as well as ground stacked configurations. Recessed handles, skids, and a top-mounted 20 mm socket even allow the al-4SB to be used in portable configurations. Recessed, rear-mounted Neutrik® Speakon sockets provide easy input and output connection. Ultimate performance is achieved when the al-4SB is used with one of VUE’s VUEDrive™ Systems Engines. Custom al-4SB settings are available to optimize the powerful processors inside the V4 and V6 units specifically for the al-4SB. In addition, VUEDrive™ amplifiers provide ample power for two al-4SB systems with the V4, and up to four al-4SB systems with the V6.